From the Ponder Couch: This is My Guitar! 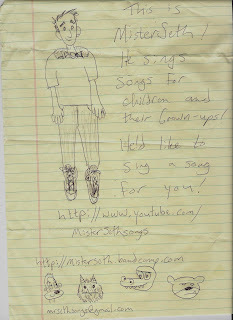 - a MisterSeth song! This is a song I wrote to go with the drawings of my guitar and other things that the children from the Day Early Learning Park 100 (https://www.earlylearningin.org/day-e...) preschool classes gave me! it has 6 different strings! It plays my favorite music! I strum it when I sing! I love what it can do! I'm playing it for you! I play it with a pick! I play piano with my fingers! I play a drum with sticks! It makes a happy sound! I don't want to put it down! I play it fast and slow! I play it soft! I play it loud! I play it high and low! I play it just for you! And I hope you love it too! You should follow me on facebook!